"Every child is an artist." Pablo Picasso's quote hangs on the wall in our playroom right above our art table, and reminds me every day to encourage my boys to explore art in new and interesting ways. So with this month's Poppins Book Nook theme of artists, I thought it would be a great time to discover a book on artists that they would enjoy and hopefully inspire some art at home. I had no idea how they would end up inspiring me instead. 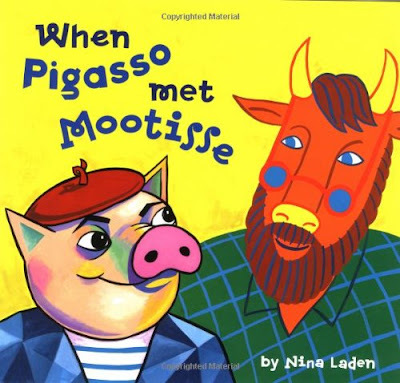 We started with a wonderful book, When Pigasso Met Mootisse by Nina Laden. Pigasso and Mootisse are both celebrated artists with very different styles. They become neighbors and their artistic tempers flare as they engage in a heated feud. But in the end, they realize that both of their styles have value and they become friends. Inspired by the true friendship of Pablo Picasso and Henri Matisse, When Pigasso Met Mootisse is a fun introduction to famous artists for the preschool crowd. My boys love When Pigasso Met Mootisse (they love anything with pigs and cows), and when I found costume pig and cow noses on a recent shopping trip (thank goodness for Halloween!) I thought they'd have fun playing Pigasso and Mootisse themselves. I covered our art table in paper (I love to use roll paper and just tape it down) I put some washable paint on a plate along with our pig snout and cow nose. I invited the boys over and showed them how to make prints with the noses. They were intrigued and started checking it out, but then something happened. They decided it would be a great idea to finger paint instead! One of my sons has never been big on finger painting, but he went at it with gusto. As they painted, I found something else amazing going on. While they play well together, when they do crafts, they are usually focused on their own project. This time they really wanted to work together to create. As I watched them do something completely different from what I had intended, I took a moment to admire their process, which is truly what children's art is about. And at the same time, they were embracing the message behind When Pigasso Met Mootisse - that everyone's work has value and our true joy lies in our art and our friends. And they made a pretty awesome masterpiece too. I even decided to get in on the art and made a pig snout stamp or two. While this activity wasn't originally what I had in mind, it turned out to be so much more. The boys thoroughly enjoyed the process of creating art, worked together, and expressed themselves through their painting. They truly embodied Picasso's words, "every child is an artist," and reminded me to enjoy seeing the world through their eyes. 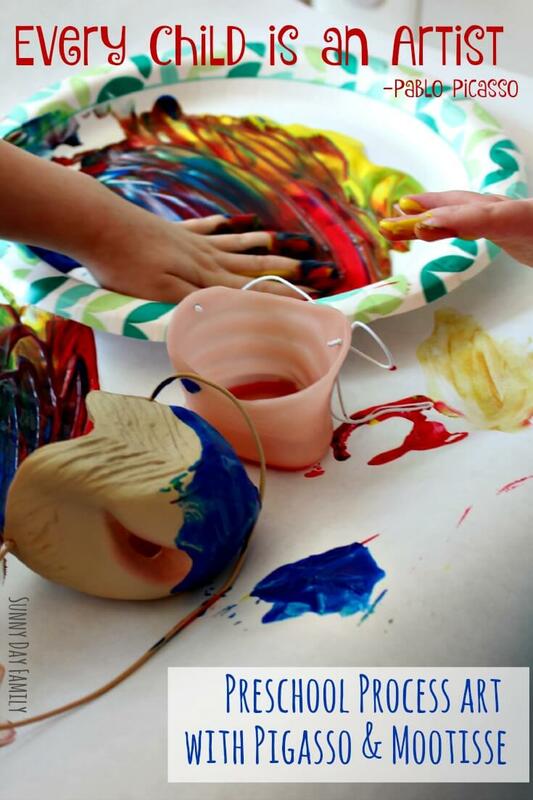 For more preschool art activities, check out the Exploring Art History with Preschoolers series on Playground Parkbench. Want more painting ideas? Try painting farm animals or no mess splatter painting! So cute - we LOVED this book! Thanks so much for the shout out as well!